1) This paper was presented at the commission 3 meeting, 4-7 November 2014 in Bologna, Italy. The paper aims at distinguishing between the Crowdsourcing and Wisdom of the Crowd, via the quantitative and theoretical examination of two widely used location based services: OpenStreetMap (OSM), and Waze. The revolution of web 2.0 has brought the development of two important working methodologies: Crowdsourcing and Wisdom of the Crowd. The two are widely used today in a variety of research and working fields, let alone within the mapping and geo-information discipline. Still, these two terms are commonly misused and replaced. This paper aims at distinguishing between the two, via the quantitative and theoretical examination of two widely used location based services: OpenStreetMap (OSM), and Waze. Four indices are defined and examined within the scope of this research, aiming to investigate and emphasize on the differences existing between the two terms in respect to these services, namely: diversity, decentralization, independency, and aggregation. It was found that OSM is a very good example to a crowdsourcing project and Waze is more wisdom of the crowd project than crowdsourcing project. Since the 1990s, there has been significant development of online publishing tools, and particularly of the World Wide Web (WWW) (Berners-Lee et al., 1992). Such developments have simplified interaction between users and navigation through enormous amounts of data and information. The invention of the WWW is especially meaningful, mainly due to the development of its interface (Bowman et al., 1994), which enabled the visualization of geographic information. Years later, new mapping applications deluged the Internet; this trend became known as 'The Geographic World Wide Web' (or 'the GeoWeb') (Haklay et al., 2008). The GeoWeb became a platform for the breakthrough of online Geographical Information Systems (GIS) in the mid 2000's. This made it possible for the mapping field to become not only an experts' domain, but also a public domain. Users all over the world were involved in data processing, mainly thanks to Web 2.0 technologies, thus public mapping has become widely used (Haklay, 2010). More and more mapping and location based projects and services were using group of volunteers to collect and disseminate data (as opposed to authoritative mapping agencies), making it possible to create and update geospatial information infrastructure, such as an online map, having the aspiration to actually replace licensed surveyors, cartographers and geographer experts, e.g., authoritative sources. This phenomenon is known as neogeography, and has contributed to the development of two important working methodologies: Crowdsourcing and Wisdom of the Crowd, widely used today within the mapping and geo-information discipline. Diversity – each individual contributes different pieces of information. Decentralization – the crowd answers are not influenced from the hierarchy above them (e.g., founder or funder). Independence – a person's opinion is not affected by people in his close vicinity but only from his or her own opinion. Aggregation – a mechanism that unifies all individual and independent opinions into a collective decision or deduction. Crowdsourcing has received a considerable attention over the past decade in a variety of research fields, such as economics, funding, computing, mapping etc., also among companies, non-profit organizations and academic communities (Zhao and Zhu, 2014). "The White Paper Version: Crowdsourcing is the act of taking a job traditionally performed by a designated agent (usually an employee) and outsourcing it to an undefined, generally large group of people in the form of an open call." "The Soundbyte Version: The application of open-source principles to fields outside of software." The Merriam-Webster online dictionary defines Crowdsourcing as "The practice of obtaining needed services, ideas, or content by soliciting contributions from a large group of people and especially from the online community rather than from traditional employees or suppliers." The most cited article dealing with the term Crowdsourcing is Brabham (2008), describing the term as "a distributed problem-solving model, is not, however, open-source practice. Problems solved and products designed by the crowd become the property of companies, who turn large profits off from this crowd labor. And the crowd knows this going in". Moreover, the author claims that "Crowdsourcing can be explained through a theory of crowd wisdom, an exercise of collective intelligence, but we should remain critical of the model for what it might do to people and how it may reinstitute long-standing mechanisms of oppression through new discourses… It is a model capable of aggregating talent, leveraging ingenuity… Crowdsourcing is enabled only through the technology of the web". Estelles-Arolas and Gonzalez-Ladron-de-Guevara (2012) tried to embed an integrated definition to Crowdsourcing: "Crowdsourcing is a type of participative online activity in which an individual, an institution, a non-profit organization, or company proposes to a group of individuals of varying knowledge, heterogeneity, and number, via a flexible open call, the voluntary undertaking of a task. The undertaking of the task, of variable complexity and modularity, and in which the crowd should participate bringing their work, money, knowledge and/or experience, always entails mutual benefit. The user will receive the satisfaction of a given type of need, be it economic, social recognition, self-esteem, or the development of individual skills, while the crowdsourcer will obtain and utilize to their advantage that what the user has brought to the venture, whose form will depend on the type of activity undertaken." Wisdom of the Crowd is commonly confused with Crowdsourcing. For example, does Wikipedia have a nature of the Wisdom of the Crowd or Crowdsourcing? Wu et al. (2011) claimed that Wikipedia is the Wisdom of the Crowd; however, Howe (2006b) and Huberman et al. (2009) claimed that it is a Crowdsourcing paradigm. Moreover, there exist research that does not distinguish between the two terms (e.g., Vukovic, 2009; Stranders et al., 2011); such a distinction should be specified. Aforementioned characterizations of Crowdsourcing and the Wisdom of the Crowd result from an analysis related to a wide diversity of fields and disciplines. However, there are no clear definitions to both terms within the geospatial domain, e.g., services, applications and processes. The aim of this research paper is to analyze these terms and working paradigms with respect to social geospatial and location based services, emphasizing on special and unique attributes and characterizations related to mapping and geo-information. Special effort is given to try and find the differences between the two terms, with the use and analysis of two key social location based services used by tens of millions of users around the globe: OSM (© OpenStreetMap contributors) and Waze (© 2009-2014 Waze Mobile). This paper is structured as follows: section 2 provides with a review of state-of-the-art and relevant research papers, followed by section 3 describing the methodology for choosing the indices (characteristics) to facilitate the examination of the two social location based services, with a general introduction of the two. Section 4 analyzes the four indices in respect to the two services to provide a clear identification to the two terms and paradigms. The results of the analysis are presented in section 5, while section 6 concludes the article. Many researchers investigate and examine the term Crowdsourcing within the scope of its implementation. A review of the term is made in Hudson-Smith et al. (2009), which describes Crowdsourcing by using principles, concepts and ideas of the term Wisdom of the Crowd. Following the authors examples to new approaches of collecting, mapping and sharing geocoded data, and definition given in the article to Crowdsourcing, it is made clear that they see little difference (if at all) between the two terms. Moreover, the authors analyze the neogeography definition through online mapping tools, such as GMapCreator and MapTube. Bihr (2010), carrying out a comparison between the two terms, describes the general similarities, as well as the differences, that exist between the two, while giving several examples. Perhaps one of author’s more significant claims is that …"Crowdsourcing can enable the Wisdom of the Crowd (but does not have to)"; still, this is not mandatory. In Alonso and Lease (2011), Crowdsourcing is explained through the term Wisdom of the Crowd. In addition, the authors present examples of the concept such as Mechanical Turk, Crowdflower etc., introduce the motivation for volunteers to contribute, and explain advantages and disadvantages of using the crowd. Recent research tries to emphasize on finding clear and consistent definitions to the term Crowdsourcing. However, it is clear, and to some extent surprising, that there is no single definition of Crowdsourcing, despite the many attempts searching for such a definition. Schenk and Guittard (2011) compare the term Crowdsourcing with several similar concepts (such as: Open Innovation, User Innovation and Free-Libre-Open Source Software), highlighting existing dissimilarities. In addition, the authors focus on defining typology of Crowdsourcing from two different views: 1) the integration of the crowd information, and, 2) the selection of one answer among provided crowd information. Tasks that can be crowdsourced were introduced and divided into three main groups: simple tasks (e.g. data collection), complex tasks (e.g. problem solving), and creative tasks (e.g. design). Finally, benefits (such as cost, quality, motivations and incentives), and drawbacks (such as lack of contributors, request definition, etc.) of Crowdsourcing were presented. In Estelles-Arolas and Gonzalez-Ladron-de-Guevara (2012), an integrated crowdsourcing definition is given, where authors try to find a wide definition that will cover as many Crowdsourcing processes as possible (see definition in Section 1.2). The author’s definition is a result of analyzing 40 original definitions, and consists of eight characteristics, as follows: 1) the defined crowd, 2) the task with clear goal, 3) clear recompense obtained, 4) identified crowdsourcer, 5) defined compensation (by crowdsourcer), 6) the type of process, 7) the call to participate, and, 8) the medium usage. These characteristics were analyzed through eleven known projects, such as Wikipedia, YouTube – and more. According to the characteristics, the authors concluded that Wikipedia and YouTube, for example, are ambiguous when it comes to a clear Crowdsourcing definition. That is because characteristics number 4, 5 and 7 do not exist in Wikipedia, while in YouTube, only characteristics 1 and 8 exist. Zhao and Zhu (2014) made an overview of the current status of Crowdsourcing research, trying to present a critical examination of the visible and invisible substrate of Crowdsourcing research, and pointed on possible future research directions. Moreover, the paper distinguished between Crowdsourcing and three related terms: Open Innovation, Outsourcing and Open Source. In addition, the authors presented a conceptualization framework of Crowdsourcing that is based on four questions: 1) who is performing the task, 2) why are they doing it, 3) how is the task performed, and, 4) what about the ownership and what is being accomplished? Summarizing the above, it is clear that although the term Crowdsourcing does not have a comprehensive definition, the term Wisdom of the Crowd has a clear definition, as presented earlier in section 1.1. Still, no up-to-date article was found that tried to analyze the term Wisdom of the Crowd with respect to new projects. Moreover, no research was found that tried to define these two terms specifically in respect to the geospatial scientific discipline and geo-services, which is the aim of this paper. Crowdsourcing and Wisdom of the Crowd are often terminologically intertwined and indefinite. This is probably because the use of these terms is common and widespread in diversity of fields and disciplines – which are also very dynamic and changing, or because they are still not enough established, and continue to adapt and transform. The comparison between the two terms is demonstrated in respect to two popular social location based services and applications that incorporate processes having geographic and geospatial characterization: OSM and Waze. The two have tens of millions of users worldwide. They offer location based services, in which volunteers are the fundamental core of creating the services via the data they collect and share. A review of abovementioned articles and an examination of uses and definitions that appear in this context have led to the selection of the following four characteristics, or indices, which characterize various processes involved in the services analyzed: 1) Diversity, 2) Decentralization, 3) Independency, and, 4) Aggregation. A comprehensive explanation of these indices is given in the next section. OSM is a collaborative online project and an open-source editable vector map of the world, created and updated by volunteers. The project aim is to create a map that is editable and free to use, especially in countries where geographic information is expensive and unreachable for individuals and small organizations, and also frequently changed (Haklay et al., 2008) (Figure 1). As such, OSM is an alternative mapping service in respect to other authoritative sources. Users can view and edit the underlying OSM data, upload GPX files (GPS traces) from hand-held GPS units or correct errors in local areas according to satellite imagery and out-of-copyright maps, which are integrated into the mapping interface (Haklay and Weber, 2008) (Figure 2). OSM is constantly widens worldwide, and nowadays match other mapping services, such as the commercial Google Maps, due to the increase of qualitative aspects of OSM, such as accuracy, completeness and reliability. Figure 1. An example of an OSM map and viewing interface – Bologna, Italy (source: OpenStreetMap.com). Figure 2. Schematics workflow for creating OSM maps (source: Haklay and Budhathoki, 2010). Waze is a social community-and-GPS-based traffic and geographical navigation service. Drivers living and driving in the same area can share real-time traffic and road information with others. Data is collected automatically from the driver simply by driving with an open Waze app, and is based on the car direction, location and speed, all sent to Waze servers for further analysis and dissemination of service to other users (Figure 3). Users can actively report traffic jams, accidents, road dangers, fuel stations with the lowest gas price along the route, speed and police control, and hazards on the road, etc. Moreover, from the online map editor users can add new roads or update existing ones, add landmarks, house numbers, etc. The collected data are aggregated and provided to the community as alerts, traffic flow updates – and more (Figure 4). Figure 3. 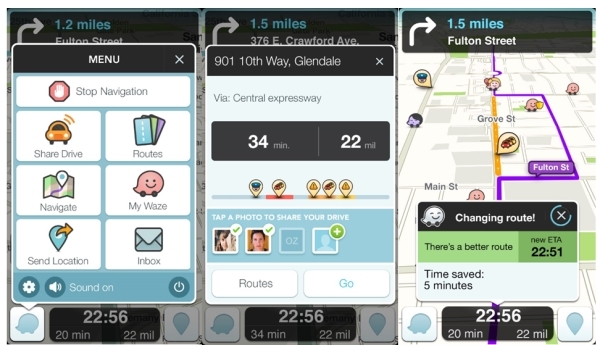 Waze interface (left to right): 1) Main menu screen; 2) Estimated time of arrival (ETA) screen and route option; 3) ETA update screen due to live update traffic (source: Waze.com). Figure 4. 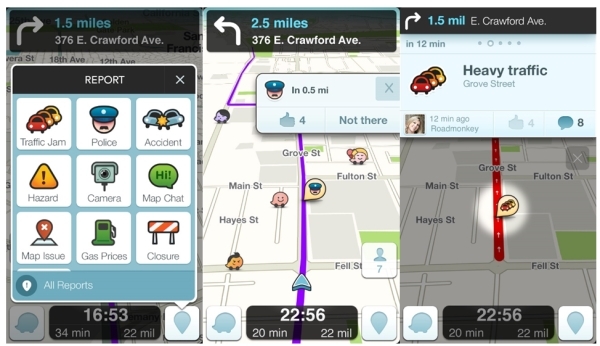 Waze interface (left to right): 1) Report Menu screen; 2) Hazard alert screen; 3) Traffic jam report screen (source: Waze.com). Volunteers participating in a task defined as Wisdom of the Crowd must produce different – and diverse – pieces of information. In fact, this is also the case for a task configured as Crowdsourcing, where the volunteers should contribute diverse data. Diversity encourages a variety of innovative ideas (Surowiecki, 2004), and in the mapping discipline it helps to cover wide topographic areas while increasing the certainty and update of the (already exiting) data. OSM and Waze gained big success thanks to the wide variety of geospatial information that volunteers contribute. In OSM, volunteers can add buildings, roads, shops, schools and everything needed to complete missing information. Waze users (drivers) can add new roads, place of accidents, police traps, road dangers, or can map a gas station with the lowest gas prices. According to current quality standards and definitions in respect to crowdsourced volunteered geographical information (e.g., Haklay, 2010), the existence of a wide range of contributors for the two services, which exist in this category, should improve the geospatial and geometric completeness of information, together with the spatial as well as the temporal quality of the mapping infrastructure. Therefore, this index is significant both in Crowdsourcing and in Wisdom of the Crowd, and thus important to the analysis of the two services chosen – but with different magnitudes. Decentralization is strongly correlated to the diversity index, due to the fact that similarity among the people having influence reduces the variety of new products: "…the more similar the ideas they appreciate will be, and so the set of new products and concepts the rest of us see will be smaller than possible" (Surowiecki, 2004). Moreover, decentralized organizations have the same aspect: "power does not fully reside in one central location, and many of the important decisions are made by individuals based on their own local and specific knowledge rather than by an omniscient or farseeing planner" (Surowiecki, 2004). Thus, the results derived from Wisdom of the Crowd will be more innovative when they are decentralized. The Crowdsourcing tasks have the same advantages of decentralized sources, i.e. funders or agents. Hence, the two terms should have a relatively high rate of decentralization aspects within services. If commercial companies can gain certain influence on the data collected, i.e., they can contribute data, such as gas station offering the cheapest gas price, such that they can directly effect on the driver's chosen route and deviate it (as with Waze). This might lead to users not trusting the information – and consequently quality of service - they receive and gain. Namely, services that are based on ‘the crowd’ aspire to get true and accurate information, and as such decentralization helps to achieve this, especially in respect to a centralized process. It is assumed that public organizations should maintain objectivity, while private and commercial companies might be biased in favor of their interests. While these concerns exist in relation to major services and projects, it is assumed that it does not occur here, due to the decentralization factor. Independent answer is essential in Wisdom of the Crowd: "independence of opinion is both a crucial ingredient in collectively wise decisions and one of the hardest things to keep intact" (Surowiecki, 2004). In Crowdsourcing, independent contribution (as in mapping) is important, but still not a crucial aspect, since contributors can be affected by contributions made by other contributors – though still having no effect on the final product. Therefore, it can be seen that while independency is essential in Wisdom of the Crowd, it is less crucial for Crowdsourcing. For example, if a volunteer sees that there is a good mapped area in OSM, possibly he/she will search for an alternative less mapped area to map. However, when a contributor is mapping a chosen area he/she should map according to his own data and knowledge. Moreover, as in Waze, the application map needs independent data - all drivers should supply their own driving route, and report their own alerts. On the other hand, a driver's route is influenced from all the information gathered from other drivers, thus having a sort of a 'chicken or an egg' effect. In Crowdsourcing, the volunteers serve as sensors (especially in mapping projects) to provide the needed data (Goodchild, 2007). There is no aggregation during the process. However, Wisdom of the Crowd takes place only if an aggregation process is implemented on the volunteers' contribution. "If that same group, though, has a means of aggregating all those different opinions, the group's collective solution may well be smarter than even the smartest person's solution" (Surowiecki, 2004). In OSM, the environment is mapped by users, whereas the most current update is added to OSM and considered as the final version. Thus, there is no aggregation measure when an OSM map is produced. However, in Waze, to receive accurate information about the place and time of a traffic jam, an aggregation of all drivers' ’reports’ is essential and crucial – without this, the Waze service will not exist. Hence, aggregation is one of the most prominent indices that defer between the two terms, i.e., Wisdom of the Crowd must have an aggregation measure while Crowdsourcing does not. Moreover, the service of Waze is expanding thanks to the aggregation of their users' updates, hence 'going social'. According to the analysis and explanation given in the previous section, a system of score (on the scale of 1-10) is given to each service, in respect to the four indices. High score represents the necessity of the index in the service; respectively, low score means low necessity of the index (Table 1). Table 1: Indices score to services: columns represent the two services, and rows represent the four indices. Score is on a 1-10 scale, where 1 represents the lowest influence of the index on the service, and 10 the highest influence. A weight system is given to each index in respect to the two terms – how significant or influential the index is to the term. We have analyzed each index in respect to both terms, deciding on the most appropriate score (same scale as in Table 1): Crowdsourcing and Wisdom of the Crowd (Table 2). Table 2: Indices score to terms: columns represent the two terms, and rows represent the four indices. Score is on a 1-10 scale, as abovementioned. Dividing the score of Table 1 by the score of Table 2, thus obtaining a normalized score for the index. Calculating the average and the Standard Deviation (SD) of each column, i.e., service, depicted in Table 3. Score with value of 1 means that a service correlates absolutely to the analyzed term (either Crowdsourcing or Wisdom of the Crowd, column left (orange) and right (green), respectively). Score with a value that is lower than 1 or more than 1 means that a service does not reflect in full either of the terms; the farthest the value from 1 is – the less correlation exists to the term. Examining Table 3, it is clear that the average score of OSM is close to 1 for Crowdsourcing (0.81), and much smaller than 1 for Wisdom of the Crowd (0.55), also having a very small SD value (0.13) for Crowdsourcing. This means that OSM has very good correlation to having the characteristics of a Crowdsourcing service. Waze, on the other hand, correlates almost perfectly as a Wisdom of the Crowd service, having a 0.95 score with a very small SD value (0.06). The Waze score of being a Crowdsourcing service is very high (3.26) with a high SD value (4.50), meaning that it cannot be characterized as a Crowdsourcing service. Table 3: Each service has two normalized scores: Crowdsourcing (left, orange), and Wisdom of the Crowd (right, green). Score of 1 represents absolute correlation. This research aimed at developing a quantitative measure to distinguish between the terms Crowdsourcing and Wisdom of the Crowd with respect to social location based services, which are geospatial by nature. Since both paradigms are tightly interrelated and do not have a clear definition – mainly when location based services are at hand – a new measuring analysis system was needed, and hence developed for this research paper. A system of four indices was decided upon, in which two key services where analyzed in respect to the four indices. Analysis showed that OSM is strongly correlated as a Crowdsourcing service (or project), as it was assumed. In contrast, Waze showed the characteristics of Wisdom of the Crowd service, and as such was more correlated to this working paradigm, mostly because its core service is based on an aggregation process; without this, such service could not exist, and hence could not serve with the adequate and expected service. Moreover, the analysis showed that a process having a Crowdsourcing nature could be transformed to be a Wisdom of the Crowd one. This occurs when volunteers continue updating data, while an appropriate aggregation measure is established. However, when the volunteers' answers and solutions are collected, and only one or a relatively small number are chosen, this has a resemblance of a Crowdsourcing service, since an aggregation process is not done. Further experiments with other indices and services can serve with a better quantitative clarification of the two terms, and the related processes they encompass. Still, due to rapid technological developments and services available, such a clear definition might be hard to achieve, since it seems that both terms are in principle flexible and dynamic. Moreover, the services themselves might not conform to the terms rubrics and characteristics, since they themselves continue to evolve, adding continuously new features and attributes. Berners-Lee, T., Cailliau, R., Groff, J. and Pollermann, B., 1992. World-Wide Web: The Information Universe. Internet Research, vol. 2, no. 1, pp. 52-58. Bihr, P., 2010. Crowdsourcing 101: Crowdsourcing vs Wisdom of the Crowd. Slides available online at http://www.slideshare.net/thewavingcat/101-crowdsourcing-vs-wisdom-of-the-crowd (accessed on: 2/10/2014). Bowman, C.M., Danzig, P.B., Hardy, D.R., Manber, U. and Schwartz, M.F., 1994. Harvest: A Scalable, Customizable Discovery and Access System. Technical rept. Colorado Univ. at Boulder Dept of Computer Science. Brabham, D.C., 2008. Crowdsourcing as a Model for Problem Solving: An Introduction and Cases. Convergence: The International Journal of Research into New Media Technologies, vol. 14, no. 1, pp. 75-90. Estelles-Arolas, E. and Gonzalez-Ladron-de-Guevara, F., 2012. Towards an integrated crowdsourcing definition. Journal of Information Science, vol. 38, no. 2, pp. 189-200. Goodchild, M., 2007. Citizens as sensors: the world of volunteered geography. GeoJournal, vol. 69, no. 4, pp. 211-221. Haklay, M., 2010. How good is volunteered geographical information? A comparative study of OpenStreetMap and ordnance survey datasets. Environment and Planning B: Planning & Design, vol. 37, no. 4, pp. 682-703. Haklay, M. and Weber P., 2008. OpenStreetMap: User-Generated Street Maps, IEEE Pervasive Computing, vol. 7, no. 4, pp. 12-18. Haklay, M. and Budhathoki, N.R., 2010. OpenStreetMap – Overview and Motivational Factors. Horizon Infrastructure Challenge Theme Day. University of Nottingham, UK. Haklay, M., Singleton, A. and Parker, C., 2008. Web Mapping 2.0: The Neogeography of the GeoWeb. Geography Compass, vol. 2, no. 6, pp. 2011–2039. Howe, J., 2006b. The Rise of Crowdsourcing. Wired Magazine, vol. 6, no. 14, pp. 183. Huberman, B.A., Romero, D.M. and Wu, F., 2009. Crowdsourcing, attention and productivity. Journal of Information Science, vol. 35, no. 6, pp. 758-765. Hudson-Smith, A., Batty, M., Crooks, A. and Milton, R., 2009. Mapping for the Masses: Accessing Web 2.0 Through Crowdsourcing. Social Science Computer Review, vol. 27, no. 4, pp. 524-538. Lorenz, J., Rauhut, H., Schweitzer, F. and Helbing, D., 2011. How social influence can undermine the Wisdom of Crowd effect. Proceedings of the National Academy of Sciences, vol. 108, no. 22, pp. 9020-9025. Neis, P. and Zielstra, D., 2014. Recent Developments and Future Trends in Volunteered Geographic Information Research: The Case of OpenStreetMap. Future Internet, vol. 6, no. 1, pp. 76-106. Schenk, E. and Guittard, C., 2011. Towards a characterization of crowdsourcing practices. Journal of Innovation Economics, vol. 7, no. 1, pp. 93-107. Stranders, R., Ramchurn, S.D., Shi, B. and Jennings, N.R., 2011. CollabMap: Augmenting Maps Using the Wisdom of Crowds. Surowiecki, J., 2004. The Wisdom of Crowds: Why the Many Are Smarter Than the Few and How Collective Wisdom Shapes Business, Economies, Societies and Nations. New York: Doubleday books. Vukovic, M., 2009. M. Crowdsourcing for Enterprises. Wu, G., Harrigan, M. and Cunningham, P., 2011. Characterizing Wikipedia pages using edit network motif profiles. Zhao, Y. and Zhu, Q., 2014. Evaluation on crowdsourcing research: Current status and future direction. Information Systems Frontiers, vol. 16, no. 3, pp. 417-434. Talia Dror is a PhD student in Mapping and Geo-Information Engineering at the Technion – Israel Institute of Technology. Dr. Sagi Dalyot is a faculty member at the Mapping and Geo-Information Engineering at the Technion – Israel Institute of Technology. Since 2011, Dr. Dalyot acts as Vice Chair of Administration, FIG Commission 3 on Spatial Information Management. His main research interests are geospatial data interpretation and integration, participatory mapping, LBS, and citizen science. Prof. Yerach Doytsher graduated from the Technion – Israel Institute of Technology in Civil Engineering. He received a M.Sc. and D.Sc. in Geodetic Engineering also from Technion. Until 1995 he was involved in geodetic and mapping projects and consultations within the private and public sectors in Israel and abroad. Since 1996 he is a faculty staff member in Civil Engineering and Environmental at the Technion. He is the Chair of FIG Commission 3 on Spatial Information Management for the term 2011-2014, and is the President of the Association of Licensed Surveyors in Israel.